Organizing professionals understand that there are some small things you can work on that make a big difference in the level of organization you feel in your home. These changes don’t take a lot of effort and can be fairly inexpensive, but you’re certain to notice the positive effect in your home. Here are some of our favorite ideas. 1) New Hangers: Changing out your mismatched, old hangers to a complete set can instantly make your closet appear more organized. The process of replacing the old ones can also be a good time to complete a clothing purge and re-organization. 2) Junk Drawer Organization: This is one area of the home that is frequently out of control. Tidying it up with some drawer organizers can feel like a huge relief for most people, but the task can be fairly quick. 3) Implement a Mail Routine: Instead of opening the mail and letting it pile up on the counter for months, institute a daily routine where you open the mail over your shredder and near you filing system. Once mail has been sorted, shred the unnecessary items and file the rest in appropriate mail system folders. 4) Labels: It can be difficult for large families to all contribute to a new system of organization. Labels can help them stick to the system and remember where things belong. Use a label maker to identify where things live in the kitchen, medicine cabinet, office, play room, and anywhere else where items are frequently used and moved. 5) Create Return, Donate, & Repair Bins: Some of the most common clutter that accumulates in homes are items that are actually meant to leave, but never quite make it out. Creating a three bin system in your garage or car can help you move these items along more quickly. When an item needs returning, donating, or repair, simply place it in the correct bin and handle on a regular basis. 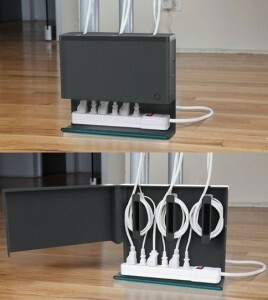 6) Contain Unsightly Cords: Use a cord organizer to discreetly contain and hide cords in your office or living room. 7) Clear off Elevated Flat Surfaces: By taking a few minutes to clear the surfaces in your home of clutter, you’ll feel a greater sense of organization throughout. All elevated flat surfaces count, so don’t forget places like dresser tops, nightstands, and kitchen counters. 8) Bathroom Cabinets: These spaces are often cluttered, but also underutilized. Measure the space and purchase bins or baskets that offer greater use of the full height and width. Organize using a like-with-like strategy. What are your favorite quick organizing ideas?